Maison de plage de luxe avec piscine privée et AC. Marchez vers la ville de Kona. Promotions de mai! Kona Bay Estates est une communauté de front de mer fermée et patrouillée. Notre maison de luxe de 2700 pieds carrés offre une vue sur l'océan, une piscine privée et des baies vitrées s'ouvrant sur la vie à l'intérieur Profitez des brises fraîches de l'océan, du bleu étincelant du Pacifique et des couchers de soleil 365 jours par an. Notre situation idéale offre une courte promenade de restaurants, bars, marchés et magasins. Airport Beach, un agréable lieu de promenade, et le Keiki Pond, une immense piscine à marée avec eau calme et plage de sable parfaite pour les jeunes enfants, sont à quelques minutes. Vous pouvez également vous rendre à pied à des courts de tennis, à une aire de jeux pour enfants, à une voie de nage libre dans une piscine communautaire, à des terrains de jeu de cornichons et à des paniers de basket-ball. Deux maîtres de bord de mer ont des lits king. Une troisième chambre avec vue sur la montagne a un lit queen. Toutes les chambres disposent d'une télévision à écran plat et d'une salle de bains complète attenante. AC est offert dans les chambres seulement. Il y a de la place pour installer un aérobed queen si nécessaire. Venez voir pourquoi la grande île est la meilleure des îles. Perfect Christmas Home Away From Home! Stayed here for a family vacation while my son raced in the Ironman World Championship. The location is as good as it gets in Kona for the race, and absolutely spectacular. The house is very comfortable with effective air conditionning in the bedrooms. 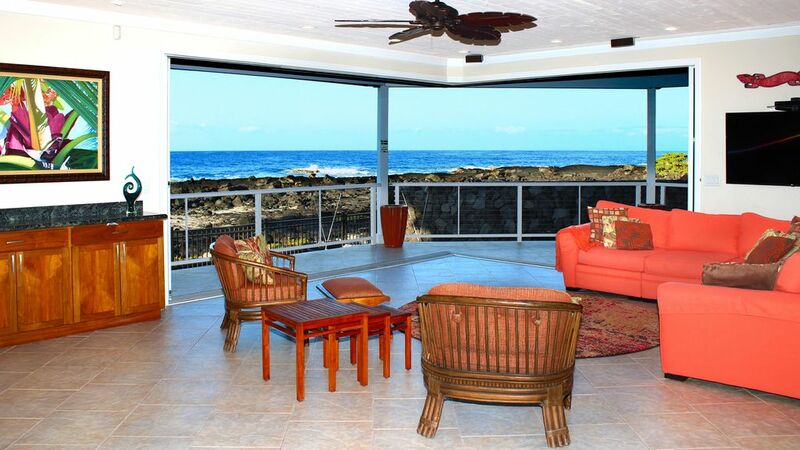 The first floor opens to the ocean with spectacular views and wonderful breezes. The house is remarkably well stocked with no need to replenish any household supplies, we did not need to buy anything extra. The kitchen had everything needed for preparing meals (even a salad spinner), and there is a gas grill that works well. All of us enjoyed the house and appreciated the response of the owner to a special need. We feel very lucky to have been able to stay at this property. So glad you loved your stay. I love to cook in our gourmet kitchen when we are at the sunset beach house. I do have all the gadgets. Thanks for renting with us. Just spent a wonderful week at Kona Sunset Beach house with family. This home is beautiful and very well stocked for Hawaii fun. Beautiful views, beaches nearby, sunsets were amazing. We used the pool everyday and it was so nice to have all the pool toys for our 2 year granddaughter old to play with. It is close to everything we needed, but far enough away to feel like we were living in paradise. We loved the huge glass doors open to let the ocean breezes in. It was very nice to have air conditioning in the bedrooms too. Playing pool in the crow's nest at night with the sound of the ocean was so much fun. We definitely hope to return again to our "Hawaii home" (as our granddaughter called it)! Glad you discovered how amazing the crows nest is for sunset. I doubt there is a better view on the island. The pictures don't do this home justice! The views from all levels of this home are amazing. All of the conveniences of home in a private community. Close to downtown Kailua-Kona. Would rent this house again in a heartbeat! Definitely enjoy your morning coffee on the third level; no better way to start the day. Angelina and Cliff were awesome! This waterfront (very close to multiple beaches & town) home has everything you need to make a great holiday with family and friends. All the on-site amenities were of good quality and as described. The owner and property manager were very quick to respond. Cooking for our family and hosting family for dinner was very easy and comfortable. We saw dolphins out the back door, watched sunsets in the crows nest and even swam with multiple turtles in the ocean (<100m from the house) in the swimming hole. The people who maintained the property (security, pool cleaner & groundskeeper) were all very friendly and helpful. One person in our group is immobile and this home is well suited for easy access and comfort. Beds were very comfortable, AC in bedrooms works wonderfully and bathrooms were functional and spacious. Huge pantry with large washer/dryer. lots of fridge space for cold drinks and food (we did one Costco run and had space for everything). Considering the hurricane just missed, we were very happy with the result and the value of this VRBO. Best we've had to date. Fabulous loaction and perfect for our family! Just returned from a wonderful visit with our two teenagers. Had a great stay. We spent a lot of time in the pool or at Keiki beach, a short walk away. We love to cook and enjoyed the use of the BBQ and wonderful kitchen. When we weren’t dining in, we loved how close we were to so many good restaurants. The house is so centrally located, which was a huge bonus. From snorkeling trips or parasailing to fishing and beaches, it was just a short drive away. Would definitely stay here again on our next visit! Parfaitement situé à 10 minutes à pied de la principale bande touristique de Kona. Le grand magasin Target et un centre commercial avec Ross Dress For Less et d’autres restaurants se trouvent à seulement cinq minutes. L'autoroute au nord de belles plages est à quelques minutes. Vous n'aurez pas à supporter le trafic Kona. Notre maison haut de gamme offre une vie en bord de mer et une piscine privée. La plage de l'aéroport et un étang de keiki adapté aux enfants sont dans la communauté. Pour votre utilisation, nous avons des clubs de golf, des vélos (utilisation à vos risques et périls), des raquettes de tennis, des planches de boogie, des planches de surf et des glacières de plage. Hawaii Tax ID Number W16150293-01 Rates may change but are secure once deposit is received. Cancellations (60) days or more prior to Arrival Date 100% of Reservation Deposit will be refunded. NO refunds possible on bookings made less than (60) days prior to Arrival Date. Cancellations, including changes that result in a shortened stay made (60) days or less prior to Arrival are Non-Refundable.